Everyone loves a good bar game. I mean, if you’re going to indulge in a cocktail, or two, and follow it up with post-drinking pizza, you might as well get some activity in. And now, you can unleash your inner lumberjack at Urban Axes in Somerville, and try your hand at hurling axes at tiny bullseyes. Sounds simple enough, right? Urban Axes, a Philadelphia-based chain, just opened its fifth national location in Somerville. The facility, which spans 7,500-square feet, features four arenas with 16 targets and can accommodate as many as 120 axe throwers. Just don’t forget close-toed shoes—those are a must. The space features a bar, and will offer beer and wine as well as charcuterie and sandwiches. 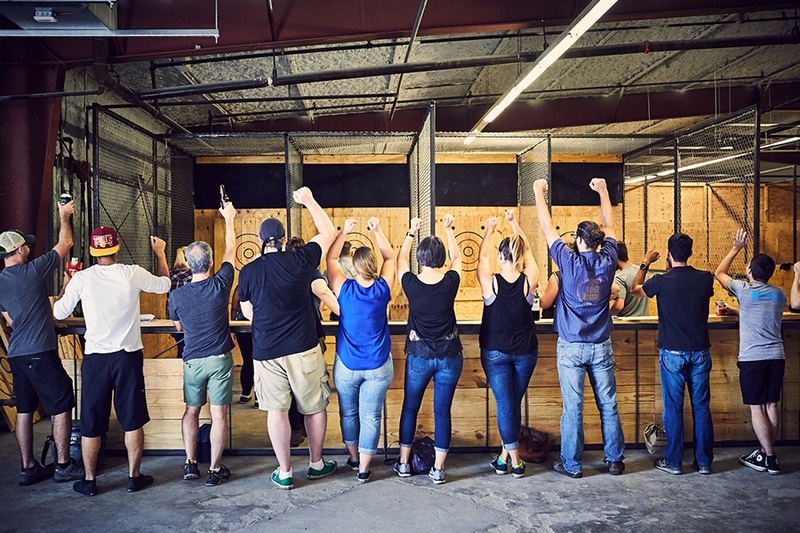 At Urban Axes, you can join an eight-week league to sharpen your skills or drop in for a walk-in session where an “Axepert” will help you stick a bullseye, while teaching you different ways to throw the axe (yes, there are many). And if you want to shake up your birthday party, corporate event, or holiday event, you can book a room and host an axe throwing tournament. The concept behind Urban Axes is to bring the traditional outdoor activity, typically performed away from urban environments (think: corn fields and country back roads), into larger cities. But this isn’t all just a bunch of country hogwash, though: Urban Axes is part of The National Axe Federation. It’s a newly established federation with the vision of creating a standard rule system to enable broad and accessible competition amongst players. The federation hosts tournaments and events all over the country and is even hosting an All-Star weekend in Toronto. It’s in February, so you have ample time to become a top player and compete. Who knows, might we see axe throwing in some future Olympics? Seems like sky is the limit for this up-and-coming sport/activity/bar game. $25, 2 Union Square, Somerville, urbanaxes.com.